How do I buy a Telstra Air® Guest Pass? You can buy a Telstra Air® Guest Pass online when you connect to a Telstra Air Wi-Fi hotspot on your compatible smartphone, tablet or laptop. You can now connect to any Telstra Air hotspot in range by selecting the ‘Connect’ button. Once connected, you’ll have access to unlimited data for the duration of your pass. One email will include a link to verify your email address. You need to do this to complete registration of your new Telstra ID, and get connected. You’ll also receive a receipt/tax invoice email. You’ll get one each time you buy a new Guest Pass. Please keep them for future reference and enquiries. Once connected you can download the Telstra Air app to make the most of Telstra Air. When is my Telstra Air Guest Pass activated? Your Telstra Air Guest Pass is activated from the moment you purchase it, NOT from when you first connect to the Telstra Air® network. You need to connect straight away to make the most of your pass. How do I know how much time is left on my Telstra Air Guest Pass? If you access Telstra Air from the Telstra Air App then you can see the Guest Pass expiry date and time in the app, with a real-time countdown of the time remaining. The expiry time is shown in your local time zone. 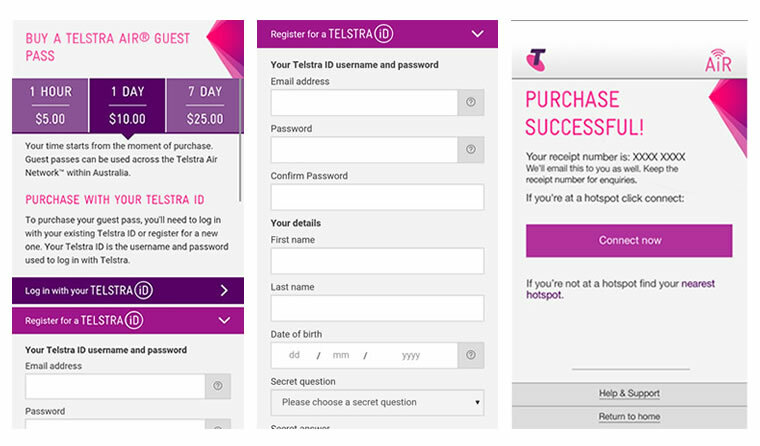 If you do not use the Telstra Air App, then each time you connect to the Telstra Air network through the login web page, you will be presented with a page showing the expiry date and time of your Telstra Air Guest Pass. This is shown in the local time zone of your web browser. What happens when my Telstra Air Guest Pass expires? If you have a 1 day or 7 day pass, you’ll be notified on-screen that it’s about to expire 1 hour beforehand. If your Guest Pass expires in the middle of an internet session, the network will automatically log you out and you will be presented with the Telstra Air login screen in your browser. When it expires you’ll get a final notification, then be logged out from the app and network. You can buy another Guest Pass whenever you’re within range of a Telstra Air hotspot. You will see a page showing when your Guest Pass has expired upon login. Follow the links to buy another guest pass whenever you’re within range of a Telstra Air hotspot. Why can’t I connect to Telstra Air® with my Guest Pass? How do I connect to Telstra Air® hotspots in Australia?